Preheat the oven to 180°C, gas mark 4. 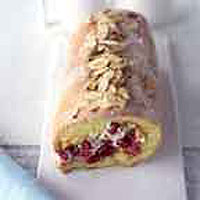 Line a 27.5cm x 32.5cm swiss roll tin with greaseproof paper and oil lightly. Mix together the ground almonds and salt. Set aside 2 tbsp sugar from the 100g. Whisk the remaining sugar with the egg yolks until they form a pale mousse that holds a trail on the surface when you lift out the whisk. Whisk the egg whites until they form soft peaks. Add the 2 tbsp caster sugar and whisk until thick and slightly glossy. Quickly fold the almond mixture into the egg yolk mousse, followed by the egg whites. Pour into the tin, spread evenly and bake for 12 minutes or until just done and shrinking away from the edges. Once the roulade is cool enough to handle, put a clean tea towel on a flat surface and top with a sheet of greaseproof paper. Sprinkle the paper with caster sugar and invert the roulade onto it. Carefully peel away the paper. Trim the edges of the sponge, and leave until cold. Sift the icing sugar into the cream and whip until it forms soft peaks. Fold in the raspberries and spread over the cold sponge, leaving a 2cm border all around. Use the paper to carefully roll up the roulade from the short end. Ease on to a serving dish, sprinkle with the almonds, dust with icing sugar and serve.